Excellent protection with a durability of 20 years. Enables graffiti removal by cold water! For 100 cycles of graffiti removal. anti-poster properties – the coating is anti-adhesive. Technical Approval of the Road and Bridge Research Institute. Allows repetitive removal of graffiti. Matt, gloss and RAL colour versions. Environmentally friendly and easy to use. UV-resistant – does not turn yellow. The most universal anti-graffiti coating. Through scientific research supported by numerous tests, we have developed a high-tech anti-graffiti paint marked KTX 07.
certified – construction mark B. 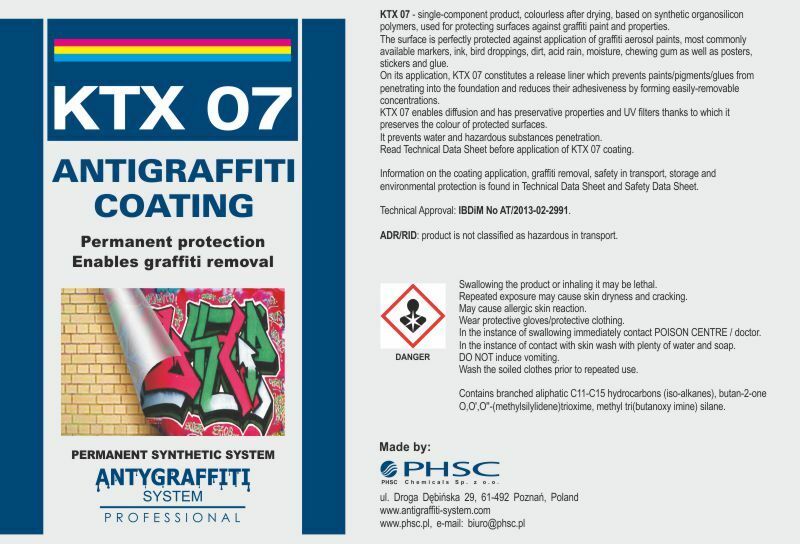 The KTX 07 anti-graffiti coating has the Technical Approval by the Road and Bridge Research Institute – it is an official state document authorising to use KTX 07 e.g. on engineering structures and in metro tubes. How does KTX 07 work? KTX 07 is a unique, single-component anti-graffiti coating which dries up creating a transparent surface and is based on synthetic organosilicone compounds, used to protect surfaces against graffiti and posters, with high anti-adhesive properties, which makes the application of posters, stickers and self-adhesive tapes difficult or even impossible. The anti-graffiti preparation is quick-drying, hardened by the air humidity, and shows a very high level of adhesion. The coating protects very well against aerosol-based graffiti paints, most commercially available markers, ink, bird droppings, dirt, acid rain, moisture, chewing gum, as well as posters, stickers and glue. 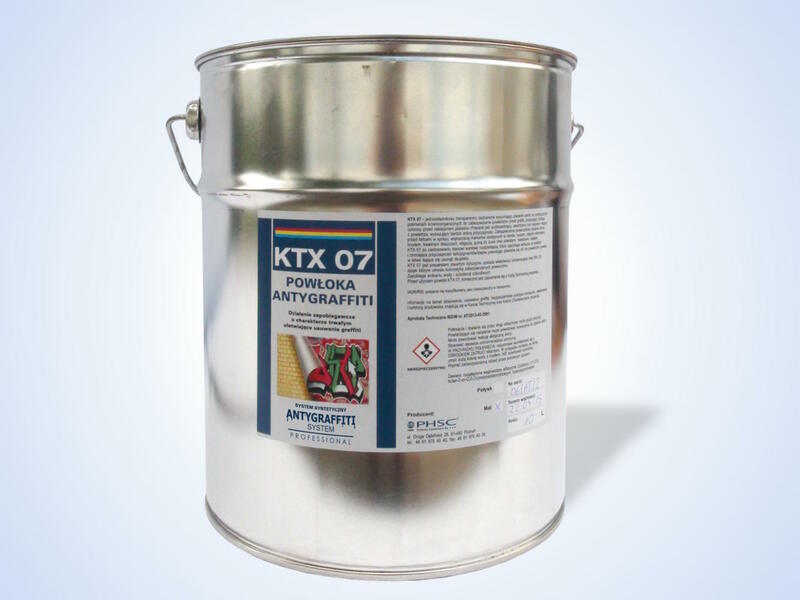 Once applied, KTX 07 forms a separation layer which prevents penetration into the substrate and reduces the adhesion of paints/pigments/glues, causing them to accumulate on the surface in groups that are easy to remove. KTX 07 is diffusion open, has preserving properties and UV filters, which help to preserve the colours of the protected surfaces. It prevents the penetration of water and harmful substances. The surface texture is maintained. The preparation is available in three variants: gloss, mat/semi-matt and RAL colour. KTX 07 has the Technical Approval No. AT/2016-02-3286 of the Road and Bridge Research Institute. Coating durability: up to 20 years. Graffiti removal: up to 100 cycles (first degree of removability). Dry film thickness: up to 180 µm. Full anti-graffiti protection: after 7 h.
Hydrophobic product. No significant reduction of steam diffusion. Full hardness: after four days. The coating has a function of an elastomer exhibiting a high level of deformability with resistance to time and adverse environmental conditions, e.g. UV radiation, alkalines, salt compounds, corrosion, thermal, biological and chemical factors. KTX 07 is a durable system which allows repetitive removal of graffiti paints. On the substrate, the anti-graffiti coating creates the effect of matt/semi-matt or gloss (depending on the version), which may be more or less visible based on the type of substrate, sunlight and light incidence angle. Certain absorptive substrates (such as concrete) may become darker – in this case we recommend the PX 07 primer, which prevents/minimises the surface darkening effect. 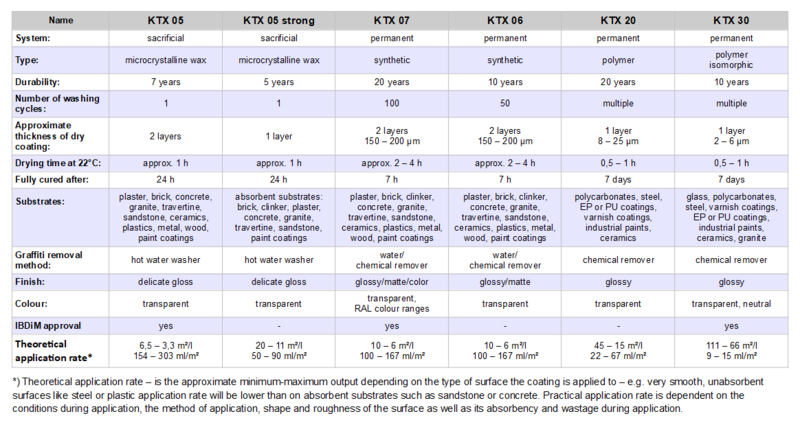 KTX 07 can be applied on absorptive surfaces, both smooth and porous, made of construction materials such as cement-lime blocks, fibre-concrete panels, brick, clinker brick, plaster, concrete, natural stone (e.g. sandstone), granite, travertine, most paints, as well as on sculptures, monuments, wood and in insulation systems. It is also suitable for non-absorptive surfaces such as ceramics, some plastics, laminates or steel. Due to the diversity of the protected substrates, before application we recommend preliminary tests to check the preparation’s reaction with the substrate, determine the adhesion, surface colour deepening, etc. KTX 07 is compatible with most primers and surface paints, including paints based on polyurethane, epoxides, 2K acrylic systems, 2K polyurethane systems, anti-corrosion and solvent-based coatings, paints and enamels based on solvents, alkyds, oil, chlorinated rubbers, nitrocellulose, as well as paints based on vinyl, acrylate, silicate and silicone dispersion. After opening the container, thoroughly mix the anti-graffiti preparation at its entire volume for approx. 1 minute using a slow-speed stirrer, and then you can start the application. 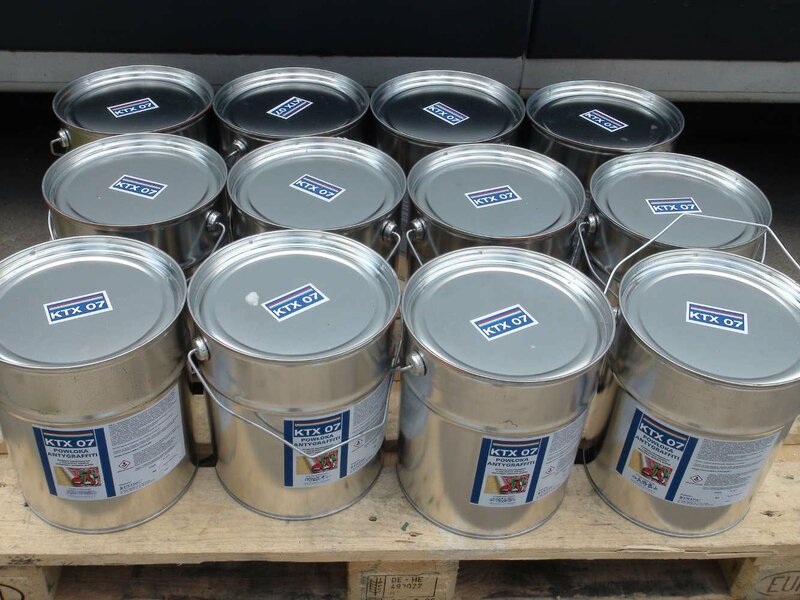 The mixing process is particularly important for matt coatings due to the matting agent, which must be carefully mixed at the entire container volume. After pouring an appropriate amount of material, close the container (the coating will harden if the container remains open). Move any unused material to other, smaller and clean containers, which should be entirely filled with the coating; any air penetration will cause a slow hardening and subsequent cross-linking of the coating. In case of prolonged application, mix the coating every 1 hour. Depending on the weather conditions, the average period of using the coating is approx. 2 hours at 20°C, but in less favourable conditions the period can extend even to 6 hours. Application of KTX 07 anti-graffiti coating: –5 to +30 °C. Application of PX 07 primer: +5 to +30 °C. The range of temperatures must remain constant throughout the coating curing period. The coating should be applied carefully to cover all irregularities and cavities in the material structure; failure to follow this rule may cause problems in graffiti removal. Apply one or two layers of the preparation. In case of highly absorptive materials, we recommend using two layers of PX 07 primer. The primer will reduce the coating wear and prevent/minimise darkening of the protected surface. The interval between applying the primer and the first layer of anti-graffiti coating should be approx. 24 hours. After approx. 4 hours, at a curing temperature of 20°C, the surface of the anti-graffiti coating becomes hard and you can apply the next layer. The coating becomes fully dry after 6 to 7 hours at +20°C. There are no time limitations for the application of the second layer or filling up the coating. In case of long intervals between applying the layers, wash the surface with water to remove dust or other contaminants. When applying the coating on fresh painted substrates, wait for a couple of days for the paint to get seasoned. If the coating does not attach well to the substrate, use a primer suitable for the type of substrate. Make sure that you do not apply too much coating on smooth surfaces; in case of sagging, use a roller to distribute the coating on the substrate before it dries up. The preparation may be applied using pneumatic or hydrodynamic spraying, with a 12-17 nozzle, or using rollers for solvent-based paints. It can be used in ventilated rooms. As a rule, 1 to 2 layers should be applied. Theoretical efficiency: 6 m²/1 L (167 ml/m²) to 10 m²/1 L (100 ml/m²). The theoretical efficiency is given in approximate values which specify the extreme amounts used, which differ depending on the type of substrate to be protected. 7 m²/1 L (143 ml/m²) to 9 m² /1 L (111 ml/m²), in total per two layers, e.g. paints, brick. 6 m²/1 L (167 ml/m²), in total per two layers, e.g. sandstone, limestone, concrete. The consumption may be higher on absorptive substrates. up to 10 m²/1 L (100 ml/m²), one to two layers, e.g. steel, ceramics, granite, powder-coated surfaces. Practical efficiency: depending on individual cases and applications, including: conditions during application, method of application, shape and roughness of the surface to be protected, substrate absorption and losses during application. PX 07: 8.3 m²/1 L, (120 ml/m²), in total per two layers. PN-EN 1062-3:2008 Paints and varnishes – Coating materials and coating systems for exterior masonry and concrete – Part 3: Determination of liquid water permeability. PN-EN 1542:2000 Products and systems for the protection and repair of concrete structures – Test methods – Measurement of bond strength by pull-off. PN-EN 1767:2008 Products and systems for the protection and repair of concrete structures – Test methods – Infrared analysis. PN-EN ISO 2811-1:2012 Paints and varnishes – Determination of density – Part 1: Pycnometer method. PN-EN ISO 3219:2000 Plastics – Polymers/resins in the liquid state or as emulsions or dispersions – Determination of viscosity using a rotational viscometer with defined shear rate. PN-EN ISO 3251:2008 Paints, varnishes and plastics – Determination of non-volatile-matter content. PN-EN ISO 7783:2012 Paints and varnishes – Determination of water-vapour transmission properties – Cup method. PN-EN ISO 9001:2009 Quality management systems – Requirements. ASTM D6578 Standard Practice for Determination of Graffiti Resistance. Test procedure of the Road and Bridge Research Institute: PB/TM-1/13 Assessment of protective coating (or lining) condition after freeze resistance testing. Tests by the Road and Bridge Research Institute, Report of the Road and Bridge Research Institute 2016. All rights reserved. Copying content and graphics without the owner's permission is prohibited.